I can give your blog a .com domain name! I've been an artist of one kind or another my whole life. Since I started my blog "My Desert Cottage" in April of 2009 I have fallen in love with "Blogland". I am blown away be the generous nature of women in my blogging community. The creative give and take of ideas has become so important to my creative process. 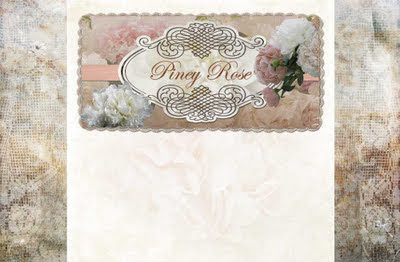 Now I have a whole new business called Valentine Design where I create beautiful blogs for my clients. I am thrilled to be able to spend my time creating, and making friends who have similar interests as mine. 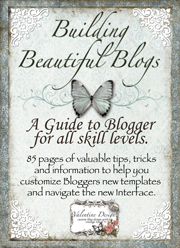 If you have a Blogger blog,this is a "must have" book! If I helped you in any way, please grab a button! Thanks to the following designers for the use of their goodies! Welcome to Valentine Design!! My goal is this........ to help spread love and friendship through blogging..... and what do most of us want?? A beautiful blog! Sometimes making changes can be intimidating. That is why I have set up Valentine Design. I want to provide women with the personal one on one help that many of us need to create a beautiful blog. You will find Custom Backgrounds,Custom Headers, and all the goodies to match as well as lots of ideas on how to build a beautiful blog or improve one that you already have. A consultation is FREE! If you choose to invite me to your blog, I will make a list of things that I think I can help with, I will give you a price for what that work will be. If you say yes, then I will send you an invoice and give your blog a "facelift". Or if you already know what you want you can choose from the services in the sidebar. Please think of me as a friend and feel free to email me so we can chat about what your needs are. I will try to keep my rates reasonable so you can create to your hearts content! Don't stop here...there's more great designs to see!!! Click on older posts above!